We Work On the Trickiest of Materials! At Bubbles Dry Cleaners, we are proud to be an expert in handling all types of clothing and shoe materials with the best in cleaning services. Because of our location in the heart of Hollywood, we understand that clothes and apparel are stars that need to shine bright and be at their absolute best. Unfortunately, not all materials and fabrics are created equal, which leaves some requiring more maintenance and upkeep in order to keep them in tip-top shape. 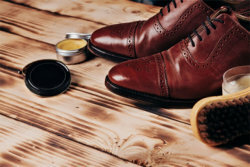 We offer leather and suede cleaning and restoration services so that you can confidently get your items looking their absolute best. If your leather or suede item needs a little care, give us a call at 323-461-6050 or 323-382-5541 and see how we can help you!